Surendra started his professional career with the Big 4 in India and joined PKF TR Upadhya & Co. in 2017. He has around 7 years of extensive experience in Statutory Audit of companies from various industries including audit of Not for Profit Organizations. With international experience, Surendra has exposure of various industries in multiple jurisdiction such as India and Nepal. 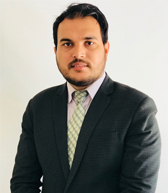 Surendra’s engagements primarily include audit of various listed “A class” financial institutions, NFRS implementation for banks and other entities, internal control review, due diligence review etc.